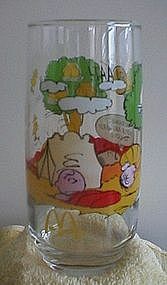 Camp Snoopy Collection glass from McDonalds featuring Charlie Brown, Linus and Snoopy. Great condition. 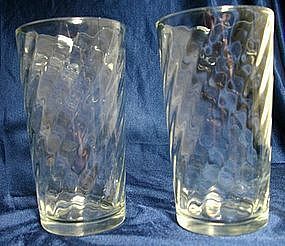 Set of four glass tumblers with swirl, spiral, or twist pattern, heavier glass, 4 3/4" tall, 2 5/8" diameter. 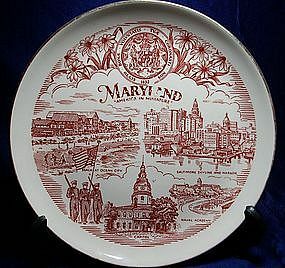 Maker unknown, not marked. Nice condition. 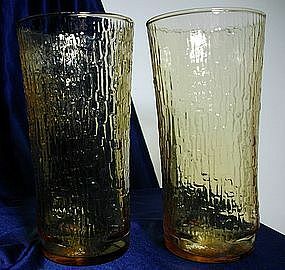 From Anchor Hocking, 2 Ice Tea size glasses, 6 7/8" tall, in the Honey Gold Pagoda Pattern. The texture resembles tree bark. Nice condition! 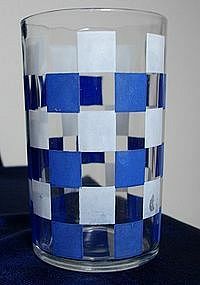 This is probably a Federal Glass juice tumbler with blue and white checks, slightly optical behind the enamel. 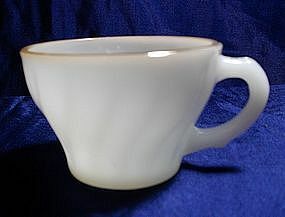 It measures 3 5/8" tall x 2 1/4" diameter. One small paint smudge on one of the white checks. 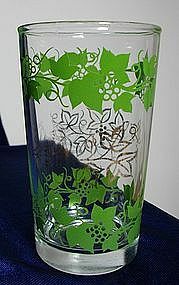 Hazel Atlas/Continental Can Co grapevine pattern juice glass, decorated with green grapevine and clusters of grapes, identical pattern in the middle in gold. Nice condition with some wear on the gold. 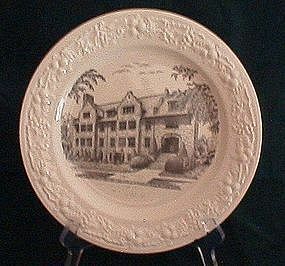 3 7/8" hi x 2 3/8" diameter. 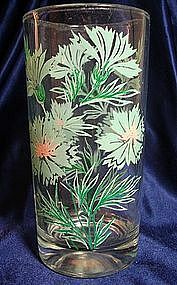 Vintage Amber Old Fashioned Tumbler in Classic pattern by Libbey, very heavy bottom. 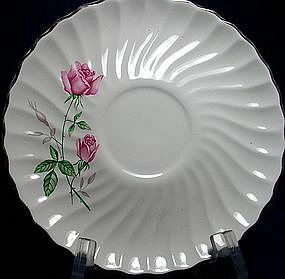 3 3/8" hi x 3 3/4" diameter, nice condition. 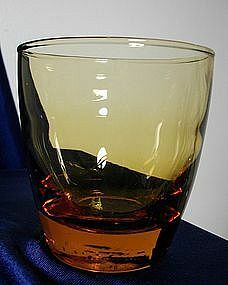 Vintage Libbey Amber glass tumbler with swirl design and easy grip ribbed bottom, nice condition. 4 1/8" hi, 2 7/8" diameter. 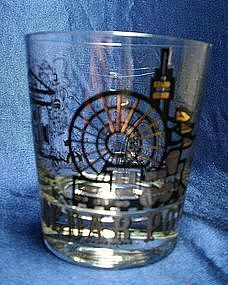 A great highball glass tumbler from Cedar Point, features several highlights from the park. Gold and black, 3 1/4" tall, thick bottom. 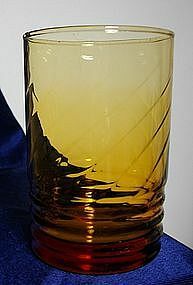 This is a large amber goblet, perhaps made by Libbey. 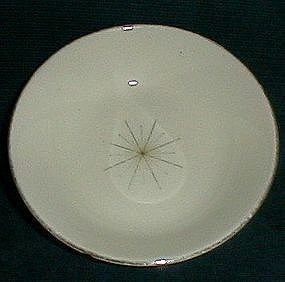 It has a Sunburst on the base, with panels around the base of the bowl. 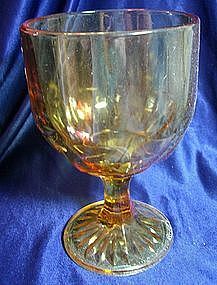 I have seen this same goblet with various soft drink and beer labels on it. It would be perfect for drinking your favorite lager from! 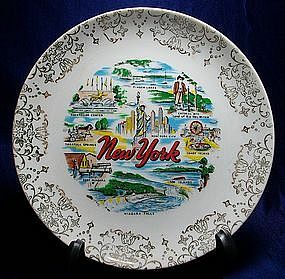 It stands 6 1/8" tall and in nice condition. 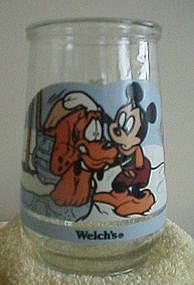 A collectible Welches/Disney Jelly Jar with Mickey Mouse and his wonderful dog Pluto, one in a series of 6, great condition. 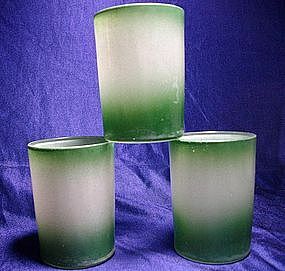 From Hazel Atlas, Juice tumblers in green and white, slightly old. 2 7/8" hi x 2 1/8" diameter. They need to be polished but overall good condition.